The Macquarie Australia iGEM team have successfully transformed Escherichia coli (DH5α) with a hydrogenase gene cluster capable of converting glucose into hydrogen gas. This was achieved with our main bio-brick submission, the Hydrogen Gas Producing Gene Cluster. This gene cluster translates to a complex consisting of the [FeFe] hydrogenase enzyme (Hyd1) (Mulder et al., 2011), Ferredoxin, Ferredoxin-NADP+-Reductase (FNR) and the maturation enzymes (HydEF and HydG). All gene codes were sourced from the eukaryote Chlamydomonas reinhardtii. In the original organism these enzymes represent the final step in the photosynthetic pathway utilised for energy transduction from sunlight. By transforming E. coli with this Hydrogen Gas Producing Gene Cluster, these enzymes work cohesively to convert glucose into hydrogen gas whilst avoiding the detrimental emissions formed during current hydrogen gas production processes. We hope that bacteria transformed with this bio-brick will become a viable source of hydrogen and contribute to the growing number of zero emission alternative renewable fuels providing electricity to address the global energy crisis. The process by which hydrogen gas is created in our E. coli requires each individual part in this HGPGC. The FNR enzyme first oxidises NADPH to NADP+ while reducing the Ferredoxin protein (both produced from BBa_K1998011). The Ferredoxin protein then donates the electron to the Hyd1 hydrogenase enzyme (BBa_K1998009), which using 2 protons gained from either the NADPH, or the breakdown of glucose creates H2 (Decottignies et al., 1995). To do this Hyd1 requires the H-cluster which is the site of catalysis to be inserted into the protein. This insertion of the H-cluster is facilitated by the maturation enzymes HydEF and HydG (Mulder et al., 2010). These maturation enzymes were assembled into a composite part by our team previously (BBa_K2300000). Fig 1. Showing the pathway from glucose to hydrogen. One of the main problems with producing hydrogen gas naturally in C. reinhardtii for industry, is that the Hyd1 hydrogenase is catalytically inactivated by oxygen which is produced naturally in the algae (Esquível et al., 2011). We are seeking to solve this through producing hydrogen gas in E. coli which is a facultative anaerobe. As all the genes are produced naturally in C. reinhardtii we chose to attempt to mimic its natural state as closely as possible in our system to ensure a greater efficiency. A similar experiment was carried out by Agapakis et al. 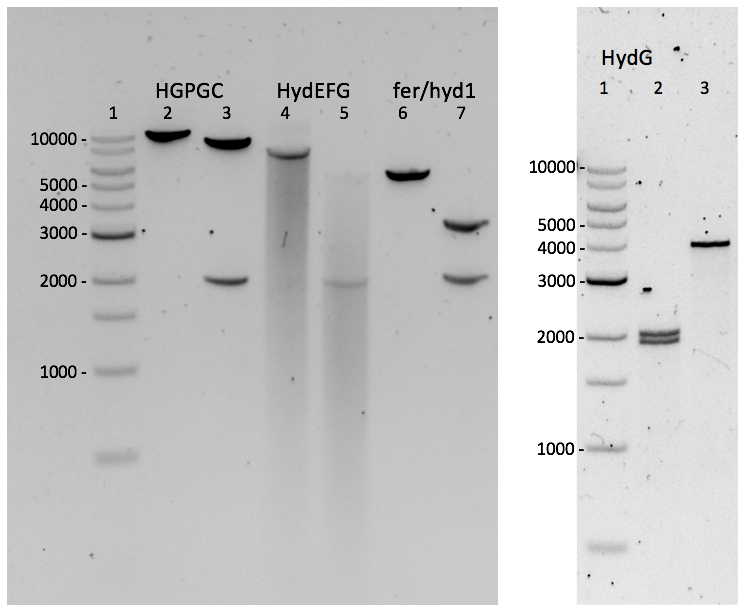 (2010) producing hydrogen via co-expression of an [FeFe] hydrogenase with ferredoxin and pyruvate-ferredoxin oxidoreductase (PFOR) in E. coli. Through testing combinations of hydrogenases, ferredoxins and PFOR from different sources they found the highest levels of hydrogen production were seen with the PFOR from Desulfovibrio africanus co-expressed with the hydrogenase and ferredoxin from Clostridium acetobutylicum. However, this model limited the theoretical yield to two moles hydrogen per one mole of glucose. They did not co-express the C. reinhardtii hydrogenase with the C. reinhardtii FNR as we have. Theoretical yield for hydrogen gas production from glucose is twelve molecules of hydrogen per glucose, however natural and genetically-modified microorganisms to date cannot produce hydrogen with a yield of more than four (Zhang, 2015). This composite part was assembled using 3A assembly by first the creation of a construction intermediate of FDX/FNR/hyd1 (BBa_S05396). Next the maturation enzyme complex of HydEFG was created (BBa_K2300000). Both these parts were then ligated together to create the HGPGC. All genes within this plasmid are sequences obtained from C. reinhardtii and codon optimised to be expressed in E. coli. The entire Hydrogen Gas Producing Gene Cluster was sequenced and confirmed once it had been ligated together. To confirm the efficacy of the ribosome binding sites in our parts we used the Salis Lab Ribosome Binding Site calculator from Penn State University. The results from this were that our ribosome binding site had a translation initiation rate of 1324.3. Fig 2. Agarose gel (1%) electrophoresis of single (EcoRI) and double (Eco-RI with PstI) digests of parts. Left: Lane 1 contains a 1kb ladder. Lanes 2 and 3 show single (~10,700bp) and double (~8700bp with ~2000bp) digests respectively of the composite Hydrogen Gas Producing Gene Cluster plasmid (HGPGC). Lanes 4 and 5 show single (~7400bp) and double (faint ~5400bp with ~2000bp) digests of hydEFG. Lanes 6 and 7 show single (~5400bp) and double digests (~3400bp with ~2000bp) of fer/hyd1. Right: Lane 1 contains a 1kb ladder. Lanes 2 and 3 show double digests (~1900bp with ~2000bp) and single digest (~3900bp) of hydG. We validated our Hydrogen Gas Producing Gene Cluster (HGPGC) part in two ways. We measured the volume of total gas produced and we measured hydrogen produced in solution. Total gas was collected and measured using an apparatus involving upturned measuring cylinders partially submerged in water and linked to cultures via tubing. In this way we could measure the total volume of gas produced over time for three cultures: HGPGC cells, Fer/Hyd cells (BBa_S05396) and original non-transformed DH5α. Hydrogen production was measured using a technique which reverses polarity of a Clark electrode which is typically used to measure oxygen in solution. In this way we were able to collect hydrogen production data across four cultures: HGPC cells (both induced and uninduced), Fer/Hyd cells and original non-transformed DH5α. Overall production of gas was much higher for our HGPGC cells (Fig. 3). A maximum rate of gas production for induced HGPGC cells was 3.39 mM H2 hr-1 (or 6.08 mL hr-1) (80 mL culture). Fig 3. 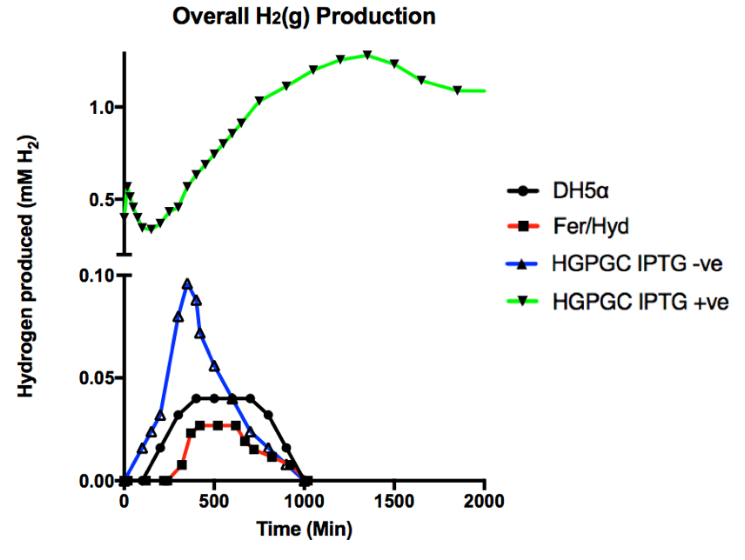 Gas production over time for the three cultures: HGPGC cells, Fer/Hyd and non-transformed DH5α. The hydrogen production in the Clark electrodes showed that production of hydrogen was not only higher in the induced HGPGC cells, compared to other cultures, but that production was sustained over a longer time period. The maximum rate of Hydrogen production for induced HGPGC cells was 0.11 mM H2 hr-1 (or 4.7 mL H2 h-1) (2 mL culture). Fig 4. Clark electrode data showing overall hydrogen production over time for the four cultures HGPGC induced and uninduced, Fer/Hyd and non-transformed DH5α. These experiments indicate that not only does our part realise the capability of producing hydrogen but, by comparison with Fer/Hyd alone, we can see that the maturation enzymes included in HGPGC cells are contributing by increasing the rate, volume and longevity of hydrogen production. HGPGC also exceeds any hydrogen production from the E. coli endogenous hydrogenase. This year again, we sought assistance from team NTU Singapore. They helped us to evaluate and validate the gene expression level of each of the genes in our Hydrogen Gas Producing Gene Cluster, by using RT-qPCR. Fig 5. 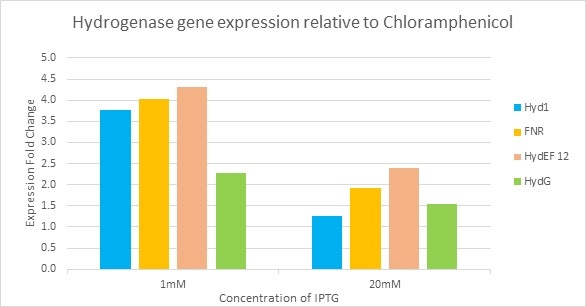 Showing the qPCR results of hydrogenase gene expression relative to Chloramphenicol with different concentrations of IPTG. This validation from Singapore helped clarify that all of the genes in our Hydrogen Gas Producing Gene Cluster were expressed. Agapakis, C.M., Ducat, D.C., Boyle, P.M., Wintermute, E.H., Way, J.C. and Silver, P.A., 2010. Insulation of a synthetic hydrogen metabolism circuit in bacteria. Journal of Biological Engineering, 4(1), p.3. Decottignies, P., Lemarechal, P., Jacquot, J.-P., Schmitter, J.-M. & Gadal, P. 1995. Primary structure and post-translational modification of ferredoxin-NADP reductase from Chlamydomonas reinhardtii. Archives of Biochemistry and Biophysics, 316, 249-259. ESQUÍVEL, M. G., AMARO, H. M., PINTO, T. S., FEVEREIRO, P. S. & MALCATA, F. X. 2011. Efficient H 2 production via Chlamydomonas reinhardtii. Trends in Biotechnology, 29, 595-600. Mulder, D.W., Boyd, E.S., Sarma, R., Lange, R.K., Endrizzi, J.A., Broderick, J.B. and Peters, J.W., 2010. Stepwise [FeFe]-hydrogenase H-cluster assembly revealed in the structure of HydA [Dgr] EFG. Nature, 465(7295), pp.248-251. Zhang, Y.H.P., 2015. Production of biofuels and biochemicals by in vitro synthetic biosystems: opportunities and challenges. Biotechnology Advances, 33(7), pp.1467-1483.